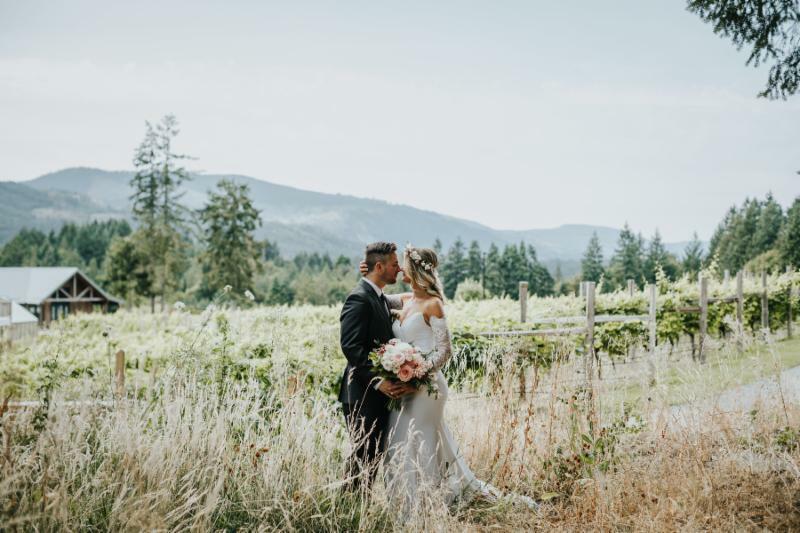 [Duncan, BC] A vineyard wedding offers the perfect earthy-chic ambiance, tied together with old-world charm. Planning it all can be daunting, so we spoke to seasoned professionals who frequently work with Blue Grouse Estate Winery for their tips and trends on how to host a dream wedding set among the vines. Follow these ideas for how to style your own. Please browse our Blue Grouse Estate Winery photo gallery with photo credits to: Sweet Heirloom Photography. Taryn Stewart of Truffles Catering says to impress with cheese cake. No, we're not talking about any creamy, sweet Cheesecake Factory confections. Cutting-edge, food-loving couples today are opting for fanciful, multi-tiered cakes made out of gourmet cheeses such as chèvre, gouda, and a host of savoury charcuterie board staples. "The trend is ideal for those that are looking to incorporate unique and distinctive wedding elements to their special day," Stewart shared. The opportunity to pair this with an array of award-winning Blue Grouse wines is surely the topping on the "cake". Charcuterie from a wedding at Blue Grouse Estate Winery. Jeffrey Bosdet photo. If you are getting married on Vancouver Island, the tenting, glassware, and more can be arranged by Dave Willie at Black and White Rentals. With more than 25 years of experience supporting Island weddings, Dave notes that gold cutlery, textured ceramic plates, chiavari chairs, and harvest tables are popular. Blue Grouse offers indoor and outdoor settings for a ceremony and reception. 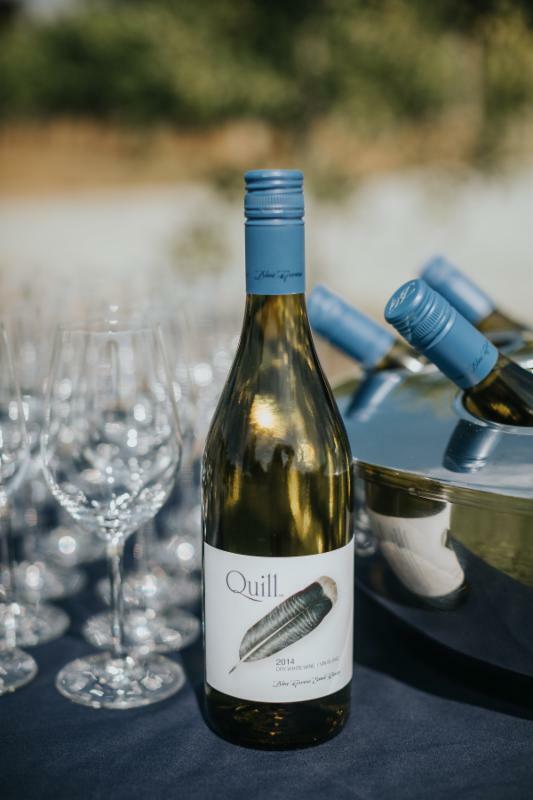 Here, Blue Grouse Estate Winery's Quill White awaits wedding guests. Sweet Heirloom Photography. Most couples today choose to have their ceremony and reception at the same venue. This is affordable, and allows a seamless transition from the ceremony to photos, mingling with cocktails, and dinner into dancing. "Staying in one spot allows more time with guests, and less stress for all by reducing travel and logistics," discloses Christine Smart of Smart Events. With a venue as vast and versatile as Blue Grouse Estate Winery, transitions are simplified and complicated coordination is eliminated. "Blue Grouse Estate Winery offers a stunning contemporary building which allows traditional table settings and florals to become a focal point", she adds. The colour tones of the setting at Blue Grouse Estate Winery are natural and very easy to complement. With this in mind, those getting married have creative freedom for picking floral arrangements that are true to their style. Pantone's colour of the year for 2018 is ultra-violet, so purple lavender and pink or cream-coloured roses or peonies are on trend, but any one of your favourite flowers can be incorporated beautifully. Rich, jewel-toned blooms blended with cream-coloured peonies and natural greenery carry an air of vibrant sophistication and elegance. Thorn & Thistle photo. Next to engagement rings and the bride's dress, deciding on a venue is one of the biggest aspects of planning a wedding. Boasting 65 acres of stunning property, Blue Grouse Estate Winery is the ideal venue to make the dream of a vineyard wedding become a reality. Sweeping valley views on the ceremony grounds at Blue Grouse Estate Winery. Photo Credit Sweet Heirloom Photography. An outdoor ceremony at Blue Grouse Estate Winery can accommodate up to 130 guests, and can be tented. Alternatively, if you want to be indoors, the inside tasting room of the winery can accommodate up to 80 guests for a seated dinner reception. Concerned about accommodations? The Grouse House offers a luxurious two-bedroom suite that is a convenient location to rent for pre-ceremony wedding party preparations and a beautiful post-ceremony rest. Upon booking your wedding, you will receive $100.00 off of your stay per night at Grouse House. For inquiries about booking a wedding at Blue Grouse Estate Winery and/or a stay at the brand new Grouse House, contact Jenny. Family-owned, sustainably-farmed and award-winning, Blue Grouse Estate Winery is located in Duncan, in the heart of the Cowichan Valley on Vancouver Island. The winery and surrounding vineyards are a sought after destination not only for sampling the winery's award-winning portfolio of wines, but also for events, picnics and family adventures. Blue Grouse Estate Winery announces the highly-anticipated opening of Grouse House, an exclusive 'Bed & Bottle' retreat for wine lovers, exquisitely set within the heart of the historic estate vineyard. Located within minutes from the quaint seaside community of Cowichan Bay and less than an hour from downtown Victoria, the Cowichan Valley wine experience has never been better. The two-bedroom suite sleeps four, making it ideal for couples or a small family. A modern kitchen is the perfect place to create meals made from the treasures picked up at the Duncan Farmers Market. The panoramic outdoor patio space offers a barbecue and a place to lounge while enjoying a complimentary bottle of wine from Blue Grouse Estate Winery. Other amenities include luxurious linens and towels, a gas fireplace, air-conditioning and complimentary WiFi. The Grouse House is perfect for wedding and honeymoon stays, family adventures, or small corporate retreats. Escape today and enjoy the very best that Island wine country has to offer. Photos of the Grouse House for media found here. Family-owned, sustainably-farmed and award-winning, Blue Grouse Estate Winery is located in Duncan, in the heart of the Cowichan Valley on Vancouver Island. The winery and surrounding vineyards are a sought after destination not only for sampling the winery's portfolio of award-winning wines, but also for evens, picnics, and family adventures. The inspired winery facility was but with many sustainable elements including locally-sourced construction materials, the use of geothermal energy, onsite water collection and treatment, as well as other features that reduce energy consumption. The Blue Grouse tasting room is open year round with season hours. For the hours when you plan your visit, visit bluegrouse.ca. If you have any additional questions about Grouse House, please feel free to contact us at Town Hall Brands. We just interact with so many amazing people that we want to expand networks and introduce them to you, and you to them. This week #withTownHall for something a little different, we introduce you to Blue Grouse Estate Winery. We do this because today is their grand reopening! Family-owned, sustainably-farmed and award-winning, Blue Grouse Estate Winery is located at 2182 Lakeside Road, Duncan, BC within the Cowichan Valley on Vancouver Island. The new winery and surrounding vineyards are a sought after destination not only for sampling the winery's award-winning portfolio of Island wines, but also for picnics and family adventures. The inspired new winery facility was built with many sustainable elements including locally-sourced construction materials, the use of geothermal energy, onsite water collection and treatment, as well as other features that reduce mechanical heating and cooling. The new Blue Grouse tasting room is open daily from 11AM to 5PM from June to October. Call 250-743-3834 or email tastingroom@bluegrouse.ca for winter hours, group bookings or just to say hello. Please help us congratulate the team on their new winery opening and say a big hello. Leave a comment below – or go give this post a like or share on Facebook or Twitter.